Frank YangFor those not in the business of keeping up with the buzz bands of the moment, Palma Violets may not yet have appeared on your radar. Though the release of their debut album 180 is still a month out, they’ve already been heralded as the vanguard of the return of guitar rock – I didn’t realize it had ever gone away – and various permutations of This Year’s Model. A title which, while a tremendously helpful leg up as far as getting people interested goes, is also a decidedly two-edged thing as by its very definition, it means that next year it’ll be someone else. Perhaps this is was why they opted to stage a North American tour before their record was out or the buzz had necessarily carried over the Atlantic except to the most devout Anglophiles; they built their name in the UK based on their live show, so why not do the same over here? And so, motivated by curiosity and an urge to get the first show of 2013 in the books, even in the tail end of a frigid cold snap, it was to the Horseshoe I went last Thursday night. Opening up were some familiar faces in Always – very familiar, as they’d also supported the last few shows I caught at the end of 2012; such ubiquity from an act that had done its best to keep as low a profile online as possible. Each time out had been a little different, however – the full five-piece lineup that opened for The Joy Formidable was back following the stripped-down trio configuration that supported Joel Plaskett, and superficially frontwoman Molly Rankin was now very blonde. The tunes, as always, were indie-pop gems and with the full band back in place, it was a chance to again appreciate how well-arranged and fully-formed the songs were and their selection of The Primitives’ 1988 UK hit “Crash” as a cover was perfectly suited. Perhaps best of all, the online demos that went AWOL shortly after my first writeup on the band have now been replaced with properly-recorded versions that are meant for public ears to hear, so you don’t have to take my word for anything anymore – just go listen. I’d spent the weeks leading up to the show assuming that the middle band on the will was this Decades – a metal band from Albany, New York – and not this Decades from right here in Toronto. Bands, let this be a warning for you and your generic names. Even when the five-piece took the stage and clearly weren’t metal-punk bros, their wildly-mixed aesthetic – flowery shirts, fedoras, medallions, hoodies, eyeliner – didn’t offer much guidance as to what to expect. When they started playing, however, it all came together as a well-studied blend of goth and New Wave that struck a good balance between concise and atmospheric and was over and done in under 30 minutes. They’d have benefitted from a cleaner mix – particular on the vocals and guitar – and a decision to either commit to or dispense with a look, but were enjoyable well beyond simply not being what I feared/expected. 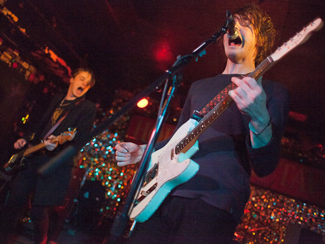 The problem, as Palma Violets are likely to find as their coming-out party progresses through 2013, is the question that will be asked will not simply be “are they good?” but “do they live up to the hype?”. And based on the three singles they’ve released to date and this show, the answer from this quarter to the former will be “not bad,” but to the latter, “no”. Frontmen Sam Fryer and Chilli Jesson have a great energy and chemistry onstage and do a good job of engaging a favourably disposed audience, but they don’t have the same facility for melody or anthemicism as the band they’re most frequently compared to, The Libertines. Their approach is punkier and more willing to descend into noisier, thuggish territory which goes to the band’s good live reputation but ultimately and most importantly, the songs aren’t very memorable. Their biggest single to date – “Best Of Friends” – succeeded in inciting a bit of laddish dancing and singalongs, but there wasn’t much sense that they brought anything more to the game than all the bands that held their place in the spotlight in years past. This isn’t to say that 180 won’t still surprise and reveal new depths, but whether their career trajectory will go more the way of The Vaccines or Brother remains unclear. DIY gets to know The History Of Apple Pie, whose debut Out Of View is out this week. The Guardian, Clash, and Spin profile Frightened Rabbit and their new album Pedestrian Verse. It’s out next week on February 5, but is available to stream at The Guardian right now. They’re at The Phoenix on March 31. NME reports that British Sea Power have completed work on their next album and will release Machineries Of Joy on April 1. 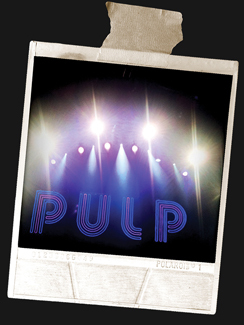 If you’d been hoping that the new old Pulp song that surfaced at the very end of last year might become available to purchase legitimately, rejoice – Artrocker reports that it should be available for iTunes download as of today (though not there at the moment, as far as I can tell). But if you’re happy with the stream, that’s cool too. Jarv ain’t fussed. DIY and Elle interview The Joy Formidable. They’re at The Phoenix on April 12. Rolling Stone talks to guitarist Earl Slick about the secret recording sessions that produced the new David Bowie record The Next Day, out March 12. Richard Thompson’s new Electric album is up to stream at NPR; it’s out next week and he plays Massey Hall supporting Emmylou Harris on March 22. Clash and The Quietus talk to Esben & The Witch. SF Weekly interviews Patrick Wolf. Interview catches up with Emmy The Great at the Sundance Film Festival, where the film Austenland – which she scored – premiered. And normally I wouldn’t file a single tweet as news, but when it recounts Kevin Shields saying at last night’s My Bloody Valentine show as saying their new album would be available in “two to three days”… that’s news. You missed your 2012 deadline, Kev, but come through on this promise and all is forgiven. Frank YangEven since they were very small and giving away downloads of their debut mini-album A Balloon Called Moaning for free in February 2009, The Joy Formidable have been huge. Huge in ambition, both sound- and career-wise, as evidenced by their massive-sounding full-length debut The Big Roar and the relentless touring schedule that surrounded it. Since their local debut in May 2010, they’ve been through Toronto a half-dozen times, including two nights this past week – Sunday night opening for The Gaslight Anthem at The Sound Academy and then on Monday with at a last-minute showcase at The Mod Club. Since I’d seen the Welsh trio at their first three local shows, I was alright with missing their April gig at Lee’s Palace and the Gaslight show, but was pretty excited about the Mod Club one – they’d finally be showcasing some new material, what with a second album in Wolf’s Law already done and due out on January 22, and I had a feeling that their days of playing rooms as small as Mod were quickly drawing to a close. Local openers Always have done a pretty good job of keeping their internet presence the polar opposite of the ubiquity implied by their name, but they’re actually far from anonymous, particularly if you’ve an ear for east coast pop. Frontwoman Molly Rankin had/has a burgeoning solo career in addition to being part of Nova Scotia’s most famous musical family, and guitarist Alec O’Hanley toured across the country countless times as part of Two Hours Traffic before departing last year. Assuming that their sound would be some mathematical combination of their respective roots- and power-pop histories would be unimaginative, though. Their experience with writing hooks and melodies was well-evident, but it was delivered in a vintage indie jangle-pop form, striking a good balance between low-key and bubbly and taking full advantage of Rankin’s Victora Legrand-ish sleepy vocal timbre – someone call Slumberland A&R, stat. Over the course of their set, they went from complete mystery to one of my top bands to watch in the city. For warm-ups, you can’t do much better than that. In the year or so since I saw them last, The Joy Formidable have had quite the apprenticeship in playing arena-scale venues opening for the likes of Foo Fighters and Muse, and when you take into consideration the fact that they were a pretty explosive live act to begin with, it was reasonable to expect some fireworks. And based on the physical evidence, at least, they were equipped to do so. Having once again taken an interest in inspecting/dissecting guitarist rigs, it was hard not to notice that frontwoman Ritzy Bryan had traded her lone, albeit overflowing, pedalboard and single combo amp for a sleek, space-age floorboard with touchscreen tablet controls and an amplification setup that powered some 18 speakers. Arenas, remember? 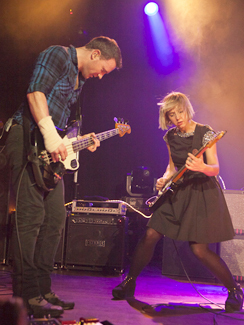 But what makes The Joy Formidable so, well, formidable, isn’t the hardware – it’s the massive rock it’s used to move. Shoegaze with the wallflower personality excised in favour of extroversion, given shape in Bryan’s diminutive form (and crazy eyes) and huge guitar chops, with rhythm section Rhydian Dafydd and Matt Thomas doing commendable work in just keeping up. Their hour-fifteen set was split about evenly between Balloon/Roar material and previews of Wolf’s Law, although already being a couple singles deep into the album, they weren’t necessarily unfamiliar. And though the new stuff was arguably heavier and more indebted to classic British metal than the old, it all fit very nicely with the template that The Joy Formidable have been riding to success thus far. They might not necessarily be filling rooms much bigger than this normally, but they did an outstanding job of making the couple hundred in attendance feel like they were seeing something massive in an uncommonly intimate setting, and while I can’t say they’ll ever have the fanbase to fill a stadium, by god they already play like they do. And if you didn’t manage to score tickets to this show, fear not – Bryan announced that they’d be back in April. PureVolume has an interview with Ritzy Bryan. One of the early picks for UK buzz band 2013 – Palma Violets – are setting their sights on North America early; they’ll be at The Horseshoe on January 29 – tickets $12.50 – well before their debut album arrives on February 25. They’ve got kind of a Libertines thing going on, which I guess is about due to be fashionable again what with next year slated to be the “Year of the guitar” or some such nonsense. Veronica Falls are keeping the fires of anticipation stoked before their second album Waiting For Something To Happen is finally released on February 12 – they’ve announced a North American tour for next Winter – look for them March 12 at The Garrison – and released a video for the first single from the new record. Hot Chip have rolled out a new clip from this year’s In Our Heads. Loud & Quiet have an interview with Elena Tonra of Daughter. The Quietus talks to Charlotte Hatherley about Sylver Tongue. The latest Charli XCX single from her Super Ultra Mixtape now comes with a video. Guy Garvey talks to Metro just ahead of Elbow’s promised year-long hiatus. The Quietus talks to Mogwai about their latest projects, including soundtracking a French zombie television show. Because someone has to. Those hoping that that last couple years’ Pulp reunion might be an ongoing concern or even yield some new music, sorry – NME reports that Jarvis Cocker has basically declared it as having run its course. We’ll always have Spain. But wait, Britpop fans refusing to stop reliving their youth cry out, what about Blur? They’re not breaking up! No, but as The Line Of Best Fit reports, Graham Coxon put the kibosh on a new Blur record; that’s fine – intermittent singles the quality of the last ones will do. Definitely coming out next week is Parklive, the live document of this Summer’s Hyde Park show in London, and they’ve released a video clip of the final song from that show; if they had indeed called it a day, well and forever, with this show, these would have been the perfect notes to finish up on. The Quietus and Spin chat with Johnny Marr, who releases his solo debut The Messenger on February 26. Consequence Of Sound interviews Bernard Sumner and Stephen Morris of New Order.